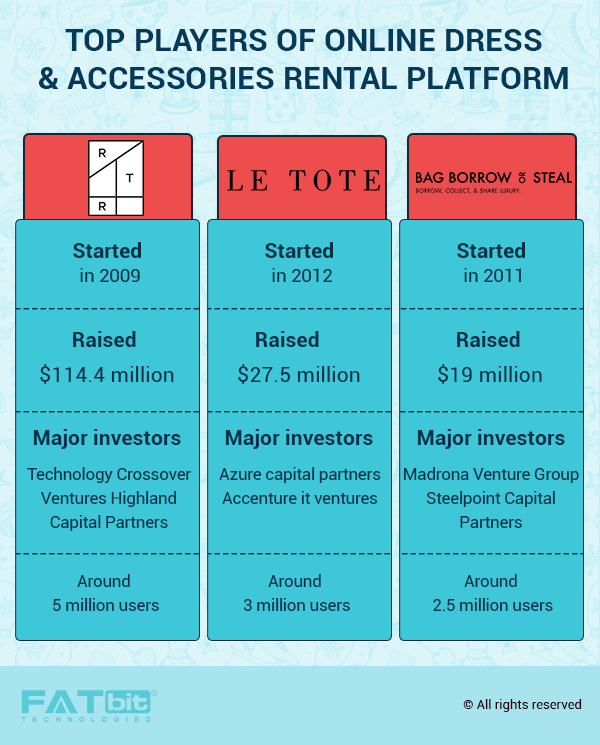 Web-based dress rental platforms Rent the Runway, Bag Borrow or Steel, Le Tote, etc. that let style-conscious women rent designers dresses and accessories are the new hot topics in the fashion industry. The idea of renting out dresses may seem odd at first, but the success of all the above-mentioned platforms has proven the potential that this emerging marketplace has. 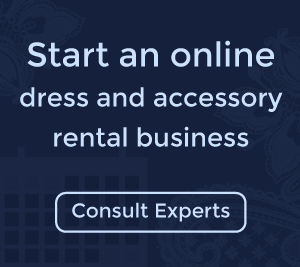 Through this post, FATbit Technologies wants to simplify the process of building a dress rental marketplace for aspiring entrepreneurs interested in launching a business like this. Read on and learn what online dress rental features you need to consider to make a superior designer, wedding, prom or any other dress rental website. 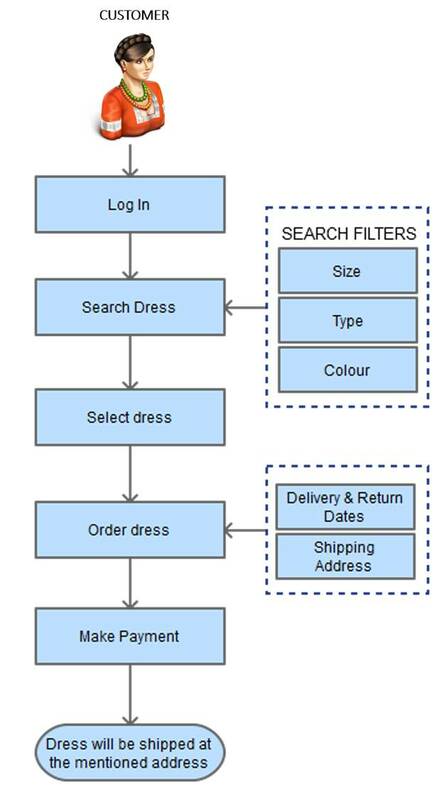 How online dress rental business works? An online dress rental portal is more than just a fashion company. It is more of a technology company that is reinventing the fashion industry. The business model is based on partnerships with top designers and agencies to give its audience access to their newest outfits and accessories. As a dress rental website owner, you will rent out items for up to a week and charge a certain percentage of the retail price as the fee. The rental fee charged covers the service charges, dry cleaning, and other minor expenditures. When the order is placed, the product will be dispatched from company’s inventory with pre-paid pre-addressed package to return the item. There should also be the provision of holding an extra amount as insurance during the rental period to cover any sort of accidental damage. 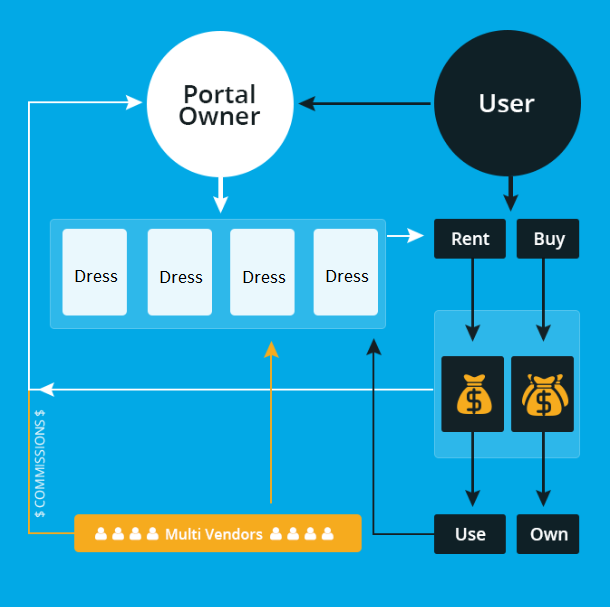 Multiple dress owners/vendors display their dresses on a common online portal called online rental marketplace,whenever a user rents a dress, admin of the portal deducts commission and rest of the payment goes to the dress owner. Hire stylists – Sometimes, just a dress is not enough to get the perfect look. Offer stylist services by entering partnerships with brands like Stylit. Featured Listing – Allow dress owners to feature their offerings on homepage & other highlighted sections of the website in exchange of a monthly fee. In addition, you can also upgrade your online dress rental platform by adding a selling feature to it. Allow fashion brands to sell their products on the website, and it will give you another revenue source as commission on those sales. Before we jump off to describe all the essential website features to include in an online dress rental platform, let’s enlist the top marketplaces of this booming industry. Most of these dress rental websites cater to a specific geographical area and, so, it would be wrong to consider them as a competition of your dress rental portal, unless they operate in the market you are targeting. Now that we are done with the business model and top online dress rental marketplaces, let’s start decoding the website features. Note: If you are planning to build apparel rental site on Rent The Runway script, then, make sure it has most – if not all – features listed in this post. Let’s begin! As just mentioned, your online dress rental platform is more of a technology business, thus its website should be loaded with lots of interesting features. Let’s start with the homepage and highlight the elements that can make it highly conversion-focused and engaging. Banner: You need to add a pinch of innovation in the homepage banner by adding two conversion elements. One should take visitors to How It Works page, other should start the dress booking process instantly. Keep in mind to use an image and a website message for the banner area to make it look more attractive. There should also be an option to view all the dress for quick scrutiny. Season Styles: The homepage should feature another eye-catching section that introduces the visitor to season’s flavor. There should also be a dedicated page for this feature that lists the season collection along with filters in a side panel to tailor results. In addition to that, to turn visitors into buyers or at least registered users, you can offer some discount on their first purchase. To make sure that they get to know about it, you can display a pop-up that highlights the discount & registration link as a user lands on the homepage of your dress rental website. This is something most ecommerce stores are doing nowadays to get user registrations and establish communication through email even if the visitor doesn’t place an order. Now, let’s take a step ahead and discuss how website’s inner pages should be designed. Item pages of your dress rental website should be an inspiration for ecommerce stores, as well as users. They should be highly informational with zero clutter. From renting process to image reviews, everything has to be organized with great UX in mind. It would be best if we cover the dress page one section at a time. Dress Images: Like most online stores dealing in clothes, your website should make provision of high-quality images worn by models. But you shouldn’t stop there. Beside the product images with great zoom, it should also have a place to display customers’ photos, who have previously rent it. Fetched from reviews, these images would help women see how a dress really looks. Implementing such competitive features will make your dress renting website valuable to users. Recommendations section: Sometimes, just one dress is not enough. That’s why your website should add ‘You may also like’ section just below the product details. 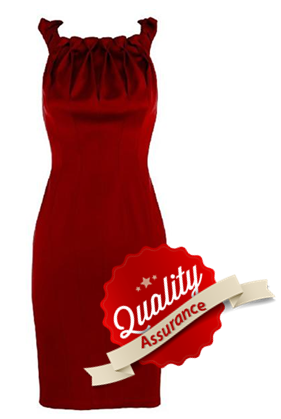 From design to its implementation, everything should be right with dress recommendation feature. Up-renting (like upselling): A dress needs accessories to complete the look and that’s exactly why you should feature a ‘Complete the look’ section on the dress page that suggest the supplementary accessories for rent. Let’s discuss how these distinguished page tabs listed above should be designed and also touch upon their unique features; starting from the Subscription tab. Subscription: This page deserves special mention because it carries the service that forms the core of your website’s revenue generation. In order to accomplish the feat of making your customers rent from you on daily basis, you need to come up with some engaging subscription plans. Like year long free delivery subscription, unlimited clothes subscription, etc. For all web designers working on rental clothing websites, our recommendation is to plan & craft this page meticulously. Designers: Under this tab, list designers who are associated with your dress rental portal. Designers should have a dedicated page of their own that features an introduction followed by their products, available for rental and sale. While all these points are pretty basic, we suggest that for booking functionality, you use a reliable third party software. This way, you will be able to bring down your dress rental website building cost, as well as provide customers a secure & well-tested payment gateway. How to find the dress of the right size, length, color, sleeve, body type, neckline, age, trend, style, and designer? The answer is simple; use the filters. So make sure that you offer a powerful set of filters that give customers complete freedom to search for what they are looking for in a seamless manner. The details required to shop a dress were gathered at the very beginning. Now is the time to furnish the card and shipping details. Unlike most ecommerce stores, your dress rental website shouldn’t bother to divide the whole process into different sections. It should be wrapped it all up in one page. Here, also remember to emphasize on the security of the payment gateway. Additionally, offer the feature that allows customers to pick up the order from stores besides getting them delivered on their doorstep. Upcoming order – View and modify your orders. Order history – View history of your orders. Assessment – Submit personal details to get style assessment. Basically, a user should be able to manage every detail of all his activities on the website through his account. This is also something your dress rental website should accomplish. Fitted with powerful search filters, intuitive contact forms, and links to other helpful resources, the Help section of your dress rental website should be capable of answering almost every query related to the website features and their functionality. Including features discussed so far will help you build an ideal dress rental clone website, but implementing following recommendations will turn into a superb one. Quality assurance is a challenge associated with every ecommerce business; but the reuse of products makes it a bit more challenging task for rental marketplaces. Renters get dresses in the same conditions they are shown on the website; when the dress is returned, it is in the right condition; etc., these are some concerns that need to be addressed proactively to keep your online rental business run smoothly. There is a possibility that your target market already has a rental marketplace; or that some new ones will arrive with time. To stand out of competition, you need to offer some unique features. Request an Item is one such feature. Its purpose is simple, if customers don’t find the dress/accessories they are looking for, they can request for it on the website. In long-term, this feature will also help you expand your offered product categories, with relatively lesser efforts on market research. Not every visitor will be comfortable with registering to favorite dresses. There are ecommerce stores that let visitors ‘like’ products and even add them to cart without insisting on registration. This is something that can be improved upon while building dress rental clone website. Every ecommerce store owner hates cart abandonment. Optimized checkout pages can play a pivotal role in minimizing its percentage. In an effort to wrap up the matter in one page, make sure you are not cluttering the checkout page. Take inspiration from other ecommerce stores and implement a design that suits you the best. The wish to dress and look fabulous is not limited to women. Men too want to look dashing while attending galas, weddings, meetings, and other special occasions. Hence, it would a huge plus point if you include renting designer clothing to men in your website. The rental model surely has its positives, especially when it comes to variety and savings. Pay attention to listed features and improvements suggested by our team, as only then will you be able to come up with an advanced online dress rental platform. Looking for a script to build your designer dress rental website? Make sure it is flexible so that changes and enhancements can be made! Posted in Online Rental Business Ideas and tagged as dress rental portal features by FATbit Chef. Thanks for reaching us out. One of our representative will get back to you soon. One of our expert will get in touch with you soon. Hello, i want to build an ecommerce website with a uniqhue 3 hour delivery service in hyderabad, India. Please get back to us to help us. Our experts will get back to you soon. 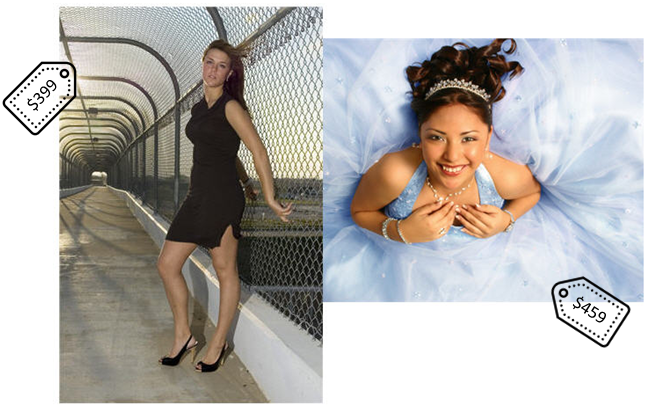 i am interested in creating an online dress rental business. Can you please get back to me asap. Our startup expert will contact you soon ! I want to start an online renting business..Please share Estimate cost that I need to put in. Hi FatBit team, exploring this business idea – need help with developing the platform. Please connect to discuss. Thanks. Hello Fatbit team, I’m interested in starting a clothing rental website, would like your help. Can you get back to me ? Meanwhile, if you have any specific requirements related to the clothing rental website, you can share with the team at salesteam@fatbit.com. This will help us serve you better. Keep visiting us for more such interesting topics. I want to start the rental business. Can you please get back to me asap. Hello I’m interested in starting an online rental company. Could someone reach out to me for consultation? One of our experts from the business development team will get in touch with you shortly. Hi there – would like to get some figures on building a clothes rental website. Please advise. Also, do you provide the back-end inventory management?